I’m very critical when I walk into bookstores. I don’t judge books by covers, but I do sometimes judge them by titles. “Vampire Academy” is one title that dealt with my cynicism. It felt like a shallow title for a shallow story, and I moved onto next book. But after hearing a friend praise the “Vampire Academy” series and me being awfully bored, I gave it a chance. What I learned: I really need to stop being a cynic because I was missing out on a great series of books. At the time, there were only the first two books out. But as the next four books were released, the author, Richelle Mead, brought the plot to interesting places, evolved the characters, and created one of the most enthralling series in young adult literature. First, the “Vampire Academy” plot is far from shallow. Mead has created a new vampire mythology (No, it’s not like “Twilight” at all). In the VA world, there are two kinds of vampires, Moroi and Strigoi. The Moroi are the good vampires. They’re considered the living vampires; they can control the elements, stay out in the sun for a little while, and drink blood without killing anyone. The Strigoi are the evil vampires. They are the undead; they have no morals, super strength, and all they do is kill for blood. Along with them are dhampirs. Dhampirs are half vampire, half human. Because they are almost exactly like humans just with super strength, they serve as guardians to the Moroi to protect them from the Strigoi. The main character in the series is Rose Hathaway, a 17 year-old dhampir. The series begins with Rose and her best friend/Moroi vampire Lissa on the run in the human world. Once they are captured, they are sent back to the vampire boarding school, St. Vladimir’s Academy, in Montana. When Lissa starts receiving anonymous threats, Rose, who has sworn to protect Lissa, tries to find out who is at the bottom of this. As the series progresses, the plot thickens. Things aren’t as simple as they were at first, and Rose’s journey takes a lot of twists and turns. Mead created a dynamic character with Rose. She’s fierce, smart, funny and exciting. I love her snarkiness and her gung-ho attitude. It stops the story from ever getting boring because Rose is never boring. When Rose returns to St. Vladimir’s, she starts to attend extra fighting lessons with one of the school’s guardians, Dimitri. Dimitri is Rose’s perfect counterpart. You instantly feel the connection and intensity between the two. And the sexual tension rises because their love is sort of forbidden. Dimitri is seven years older than Rose, who is still a minor. But let me make it clear, there is nothing gross or morally wrong with their feelings/ relationship. The feelings they have for each other are honest and real. Watching their relationship progress and evolve throughout the series is one of the main reasons why these books are so good. You feel Rose’s love, confusion, heartbreak, hope, and denial, everything when it comes to Dimitri. Rose’s friendship with Lissa is very unique. The two share a one way bond; Rose can delve into Lissa’s mind, and see and feel what Lissa can see and feel. Even though Lissa is the opposite of Rose, she remains a strong character. The two are very dependent of each other, which at first isn’t the best thing but later evolves into something perfect for them. Rose’s friendship with Lissa may not be as enthralling as hers with Dimitri but it is the catalyst for this amazing adventure. Despite how much bravado Rose likes to display, it shows how loyal and good a person she is. Rose, in my opinion, is a great character to look up to. She makes mistakes, just like any one else, but she knows how to own up to them. In young adult literature, there aren’t many characters like this, which is a shame because adolescents can be pretty impressionable. The plot is intricate and grows more complex as the series goes. But it never becomes outrageous, perplexing, or predictable. Even when I think I have it figured it out, I’m wrong. The plot twists are great, and usually leave me shouting, “Wait…WHAT? !” Mead keeps the perfect pace. It’s never too fast or too slow. (The only thing that is too fast is my reading because I can go through these books very quickly.) I got swallowed into the VA world so easily. All the side characters play vital parts, and you’ll learn to love, despise, and be surprised by all of them. Many themes play into the series; the main ones being life and death. Mead knows how to break your heart and mend it again. She also knows that life doesn’t ever fit in a nice, neat package. 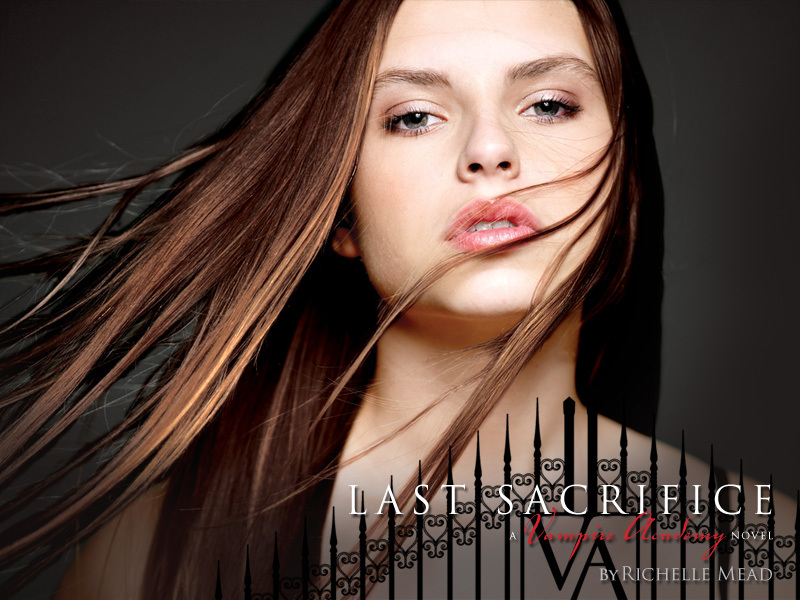 In the final book, “Last Sacrifice,” Rose is on the last leg of her journey, this time looking for justice. Many people are involved with her journey, and sometimes things don’t end perfectly. But as I mentioned about Rose earlier, she knows how to own up to her mistakes. This series ends the way it should for Rose, with a new beginning. There are still lots of loose ends, and it’s supposed to be like that. Mead is creating a spin-off of the series, making one of the side characters a main one. She hasn’t announced who the new main characters will be, but Rose, Dimitri, Lissa and company will still have a presence. Don’t be like me and judge a book by its title. ‘Vampire Academy” is one of my favorite YA supernatural series. If you love kickass characters, adventure, romance, and the supernatural, this is series is for you. (If you don’t like any of those things, what do you like then? Reagan biographies? lol jk) And if you actually sat and read this really long review, I think you owe it to yourself to start reading these books! All 6 Vampire Academy books in order: Vampire Academy, Frostbite, Shadow Kiss, Blood Promise, Spirit Bound, and Last Sacrifice. You can purchase any or all of the “Vampire Academy” books at our TYF store here!